I enjoyed this book and I believe it provides an important insight. It fits well with Thinking, fast and slow (Kahneman). The author starts with a deliberately fuzzy/loose pragmatic definition of "fact" and proceeds to explore the quantitative aspects of evolution (or temporal characteristics) of knowledge and information. He uses mathematical and statistical tools to explore patterns, suggesting common or universal mechanisms. In addition, the pitfalls and biases of dissemination of knowledge, the persistence of misinformation and the inertia for "changing our minds, when the facts change" are also explored. I learned a lot from this book. However, I found the repetition of the statement underlying regularity not an argument. I felt that the underlying potential mechanisms that lead to these regularities were tantalizingly suggested but not explored. The patterns, which I agree we do not usually consider for information/knowledge, are important but I would have liked more discussion of types of growth, graph theory (metrics and their uses), self-organized criticality, data mining etc. These are all discussed and I accept that a taste of the "unreasonable effectiveness of Mathematics" in explaining the world rather than a Mathematical book per se. This is a minor point. It reflects more my expectations than anything else. I would have liked more plots demonstrating the relationships of interest but the tables and plots did merge well with the text. 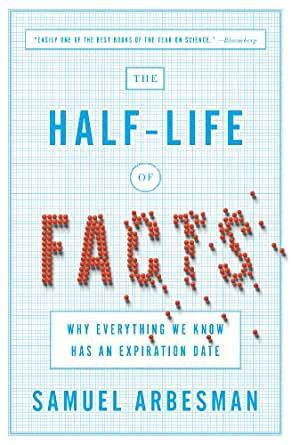 Finally, I enjoyed the cover design of the dust jacket with "FACTS" created by particles with the particles disassembling and strewn on the rest of the jacket, much as sand being blown by the "winds of change", suggesting the fragile nature of facts. This was on the background of grid lines reminiscent of graph pads from school days: a reference to Mathematics facility for understanding these changes. It's a good idea about a true state of affairs, but maybe a trade book just can't do justice to this topic and the author's overarching hypotheses. It would take a tremendous amount of research and scholarship to support, or discard, Mr. Arbesman's hypotheses about the "facts" that society, especially "science," "knows." --Yes, that's a lot of scare quotes for the last third of one sentence, but that's what the book is, or needs to be, about: What are facts, and what does it mean to know them, and is science a privileged mode of knowledge, and if so, how, and why, and Where was I? But that last little jab, like this is such a confusing and tail-chasing epistemological tangle, isn't really deserved; Arbesman's book proceeds at a good clip through a kind of main-heading argument, buttressed by examples and representative citations. Yet the book doesn't really deliver. Despite the exciting thesis, repeated in the opening paragraphs of numerous chapters, that the phenomena of exponential growth of facts and loss of facts in various fields of knowledge can be described precisely as mathematical models, what we end up with is more like those scientific findings so beloved, it seems, by the media. Researchers have found that (fill in the blank), which could lead to (fill in the blank). Alas, we seldom learn enough about such findings to know how to evaluate them; that would take much, much more effort on the reporting side than the story is worth to the publisher, and, of course, would demand much, much more of the reader than such a one would be prepared to invest in reading the newspaper or listening to the evening news. So out of a decent respect for an author whose scientific credentials are not negligible--but neither are they formidable--I will not severely criticize a work that most probably would never have seen the light of publication day, at least not outside of strictly academic publishing, had it been able to deliver much of what it promises. A mildly interesting book for a very short while, the content of which would better be presented in a magainze article. Ever since I read Toeffler's "Future Shock" I have realized that there are some ideas so simple that they can be completely expressed in a sentence or two, but so grand that it takes a book-length treatment to make the impression they are entitled to. That book's central theme is the essence of simplicity--our world is changing so rapidly today that it is outpacing our ability to adapt. But putting the idea in a sentence denigrates it. It truly was worth a book. At least to me. The idea of this book is equally simple; the things we take as facts may later be proven not to be true. And the author offers plenty of examples of how our understanding of things changes. How what seemed to be facts can be overturned. To me, at least, this is pretty obvious stuff. We are constantly bombarded with :"facts" which turn out not to be correct, and anyone who goes through life believing everything he hears is going to be in a lot of trouble. But the problem is not that "facts" change--it is that we are too often offered theories of why things are or happen, and these theories are too often presented as "facts." The pre-Copernican view of the solar system they knew was never a fact--it was an effort to jam all of the known facts into a theory attempting to rationalize all of the facts about the universe that were known at the time. And today is not that much better than 1500. The people who are supposed to know these things have announced that the entire universe originated with a "Big Bang" some billions of years ago. Perhaps. But that surely is not a fact. It is a theory; a conjecture. One which, incidentally, remqarkably like the conjectures of the Ancient Greek Atomists. Over time, the theory will be constantly tested as new facts are learned. Perhaps it will survive. The history of ideas suggests that it will not. There are more productive ways to spend one's time than plowing through this book. That's not a fact--it's a theory.